We operate Google analytics on the StoreWALL Australia website and it provides us with valuable information on which pages clients visit. StoreWALL bundles seem to be a very popular section of our StoreWALL online store. In this week’s post we take a look at how to build your own StoreWALL bundle. StoreWALL is a wall panel solution built for homes, workshops and garages which is equally suitable for heavy duty applications in industrial environments. The key premise with StoreWALL is that you have a wall and wall panels. If you are starting with a bare wall then you are in luck as we will work through the process helping you to build your own StoreWALL bundle. Even if you already have StoreWALL or wall panels from another supplier, you can read on as we will cover how to use our accessories on your walls. Most people come to our website looking for hooks, brackets, shelves or baskets. They have identified they need one or more of the accessories and begin to look at who supplies them, the range on offer and for how much they cost. StoreWALL accessories need a slatwall supporting them. As I mentioned earlier, this can be StoreWALL’s or someone else’s. Let’s assume at this stage that your wall is bare, made from plaster board or brick or comprised of exposed wooden studs. Slatwall Colour – Grey or Grey? Grey or Grey isn’t exactly correct as StoreWALL does offer up to 7 colours but our standard colour is Weathered Grey. Other colours are available but as a special order. Having picked Weathered Grey, the next question is what are you looking to do with your wall and considering you need slatwall panels, how much of the wall you need covered. StoreWALL offers two sizes of wall panel – 1.2m or 2.4m. If your wall space is small, the 1.2m panels will probably work best. Made from thermoplastic not only are they water proof and highly durable, they can also be cut to size. If your work area is medium or larger then the 2.4m panels will be more economical. 1.2m panels can be purchased individually or in a carton of 6 panels. Each panel covers: 0.371 sq meters. 2.4m panels can be purchased in a carton of 4 panels. Each panel covers: 0.74 sq meters. Once you have measured your wall area, simply divide it by either 0.371 or 0.74 and work out how many panels you need and whether the 1.2m or 2.4m panels will suite you best. Outside of the length, both panels are exactly the same in thickness, height and composition. We recommend using InstallStrips as it makes your wall sturdier and able to handle more weight. However they are not compulsory. If you are using InstallStrips, they will be fitted to your wall first using screws. Once fitted, the wall panels are added to them. What do I do if I don’t want InstallStrips? No problem, simply screw your wall panels directly to your wall. I suggest buying coloured screw so that they don’t show up against the panel. You can find grey coloured screws (primer coloured) at your local hardware store. Now that your wall has been taken care of, its time to Build Your Own StoreWALL Bundle. What is really obvious with StoreWALL customers is that they begin with the key accessories they need today and then add and remove accessories a couple of years later. Therefore don’t stress looking for every accessory just in case you might need it. Focus on what you need today and in the next 12 months. If and when those needs change you can adjust your wall accordingly. 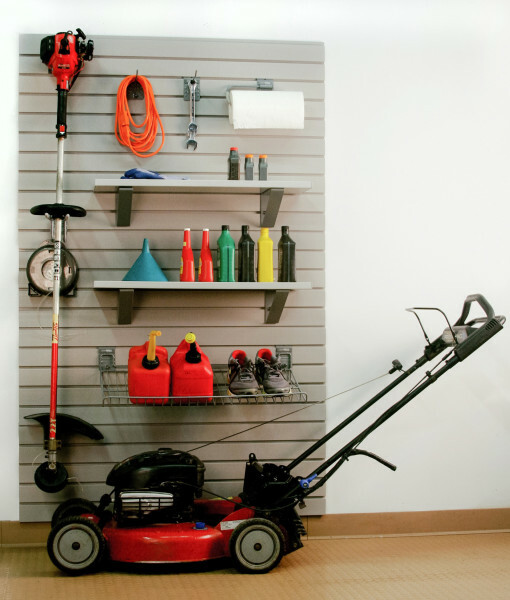 Most people need hooks, whether they be for bikes or other garage items. Hooks are a great way to get items off the ground and onto the wall so they can be accessed easily but also protected. Consider some smaller and larger hooks as a bundle. If you are interested in shelving, consider our brackets which allow you to build your own shelves. We also offer a 760 mm metal shelf which is 390 mm deep and super heavy duty. Over the next few months we hope to expand our shelves menu with some new options recently launched in the US. We also offer a great range of baskets in deep and shallow form. Baskets are a great way to store small and bulky items. The simplicity of StoreWALL means you can combine a range of accessories and lock them in so they are secure or move them around when you want to adjust your settings.